ZAMBOANGA CITY, Philippines (Mindanao Examiner / Mar. 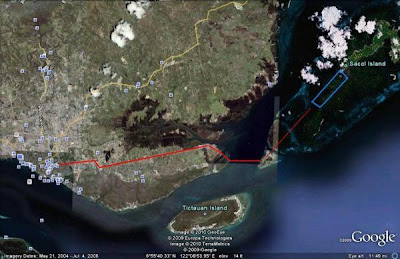 11, 2011) – An Abu Sayyaf leader wanted both by the Philippines and the United States had escaped a military raid at an island off Zamboanga City in the restive region of Mindanao, security officials said on Friday. “They have escaped from the island and we are tracking down the Abu Sayyafs,” said Army Lieutenant Colonel Randolph Cabangbang, a regional military spokesman. He said troops lost track of Khair Mundos and his deputy Puruji Indama and 15 of their followers in Sacol Island after military operations on Thursday. Air force attack helicopters fired rockets and dropped assault soldiers on the island, but they missed their targets who escaped on speed boats hours later. It was unknown where the militants with links to al-Qaeda and Jemaah Islamiya had fled, but the island is just several nautical miles away from Basilan province, a stronghold of the Abu Sayyaf where security forces are battling several factions of the notorious group tied to kidnappings for ransom, and terrorism. The militants were suspected of trying to bomb civilian targets, attack hotels and kidnap wealthy traders in Zamboanga, which had been previously raided. The group was tagged as behind the beheadings of soldiers and civilians in Basilan in recent years. Philippine authorities had linked Indama to Malaysian bomber Zulkifli bin Hir, alias Marwan, said to be the leader of the Kumpulun Mujahidin Malaysia. Both Mundos and Marwan are being sought by US authorities on terrorism charges and Washington offered as much as $5 million dollar reward for the capture of the foreigner and $500,000 for Mundos. Mundos was first arrested by Filipino authorities in 2004 arrest on the first-ever money laundering charges against terrorists initiated by the U.S. in coordination with Philippine officials. He escaped from jail in Mindanao three years later and had since trained new militants in bomb-making in Mindanao.